Gift basket delivered to her door! Because She's Special Gift Basket. 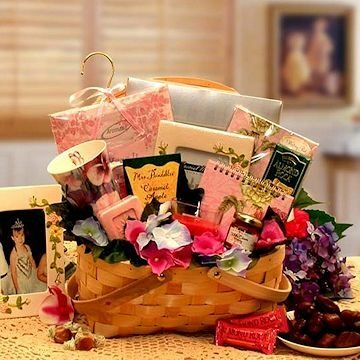 This sentimental gift basket comes in 3 sizes and has a variety of interesting gift items inside. She will be overwhelmed with gratitude when this basket arrives. Small Basket: Die cut notepad, Aromatherapy Candle 3" Pillar, Potpourri Sachet, Wildflower Honey, 3 oz asstorted Chocolates, Floral Mug, 3x5 Picture Frame, Tropical Sour Drops, Glycerin Soap, Tropical Ice Tea, in a hindged lid basket. Medium Basket: (Pictured): Die Cut Note,Aromatherapy Candle 3" Pillar, 10 pc Stationary Set, 5 oz asstorted Chocolates, Wildflower Honey, Floral Mug, 3x5 Picture Frame, Tropical Sour Drops, Glycerin Soap, Tropical Ice Tea, Mulling Spices, in a hindged lid basket. Large Basket: Pad Die Cut Note Pad, Aromatherapy Candle 3" Pillar, 25 pc Stationary Set, 8 oz asst. Chocolates, Wildflower Honey, Floral Mug, 5x7 Floral Picture Frame, Tropical Sour Drops, 2 Glycerin Soap, Tropical Ice Tea, Mulling Spices in a hindged lid basket. Gift weighs 6 lbs for small and medium and 7 lbs for large.